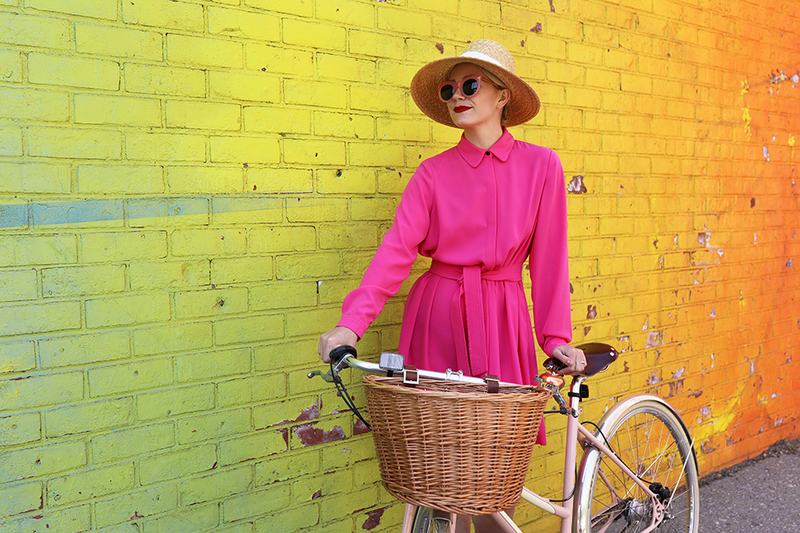 When it comes to fashion, I have always been a lover of all things colorful, and so I am thrilled to kick-off the summer season showcasing my favorite bright dress looks from Amazon Fashion. 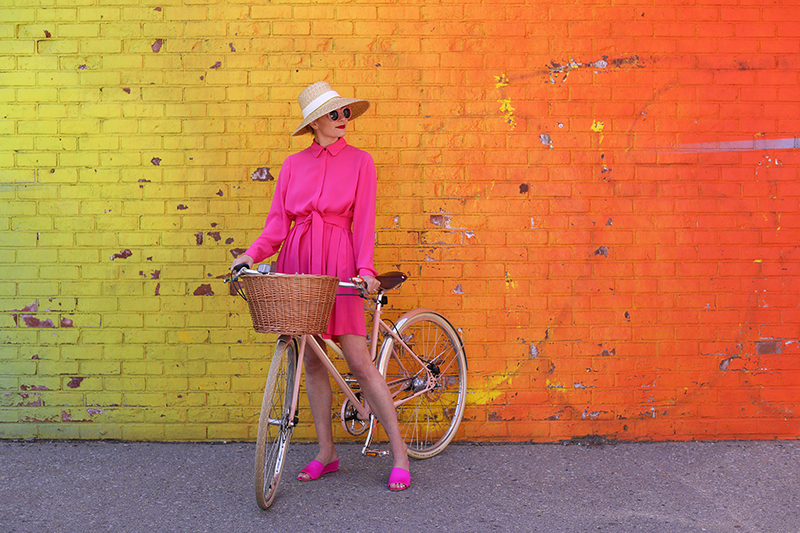 Amazon Fashion has an endless selection of rainbow colored summer pieces – including accessories – and at every price point! In pulling together my curated picks, it was so easy to search and find all the right dress silhouettes to anchor the collection, as well as add in all of the finishing touches to complete the looks. This season in the dress category, I am fully supporting the comeback of the one shoulder silhouette, happy to see the continued evolution of the shirtdress, and always excited about tone on tone color blocking! I also adore all things straw, and an array of straw hats and bags are at the very top of my accessories must-have list. Within shoes, I am thrilled to see the block heel being re-imagined in more modern ways. Living in NYC, a block heel is so much more practical for exploring the city in style! You can find all of these trends and more within my curated picks collection! Pretty in pink! Pink has always been one of my favorite fashion colors for summer. The shorter length of this Nine West belted beauty (under $50!) balanced with long sleeves and a proper collar immediately made it a favorite among my picks. 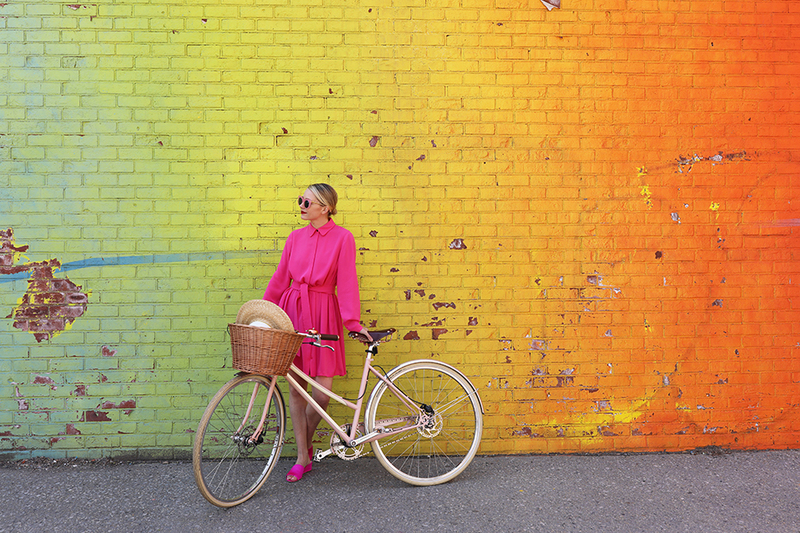 And as I have always loved a monochromatic moment, I of course had to match it back to pink slides and shades (and my pink bike)! These and more colorful items can be found among my curated picks! Orange you glad that it is finally warm outside? I found this sleeveless Mara Hoffman maxi to be absolutely stunning. The cutout yoke provided just the right level of detailing for summer. Plus, I love tan shoulders! Here I went with a higher height wedge slide sandal and playful pom pom basket bag to complete the look! Yellow brights! My number one color for spring may also just be my number one color for summer. This gorgeous one shoulder number with a single puff sleeve is so dreamy. The side buttons can be buttoned up for a more conservative look, or unbuttoned to show just a bit of leg, while the linen weave fabric will keep you cool. Tons of yellow within my picks! Mean greens. For a more unexpected color for summer, try a leafy green hue. For just a bit more coverage, I paired the above strapless frock with an adorable short sleeve woven underneath. I am also loving the continuation of the bell sleeve into summer, which is another great option if you aren’t looking to show a lot of skin. See my full rainbow must-haves right this way on Amazon Fashion! Your pictures are always Oh So Perfect! Orange dress is so beautiful. I love its color and its neckline! wow! all dresses are looking so beautiful on you, still I have not such a one but I must buy it..
Pictures are beautiful and they highlight your dresses and outfits. The dresses and the colors are very well chosen. Wow! Who knew Amazon had so much on the go? I will have to see what’s going on on the Canadian site. Oo I love these outfits in these different shades! I love going through Amazon Fashion. I find so many great things! Great post! I love that orange dress 🙂 I really need to check out Amazon Fashion now! Love this! I’ve been buying more from Amazon lately, and I’m pleasantly surprised! The yellow dress… I am speechlees.. I could live in it. As a fellow lover of all things colorful, these are truly amazing. The dresses and photos are exquisite. I’ll be checking out Amazon Fashions, as well. I love all these bright dresses! They’re perfect for summer. Great post! I love how colorful these outfits and photos are. I can’t wait to check out your collection! So much color and style here, I’m loving it!! These outfits are so perfect and PERFECT backgrounds for them too! So creative 🙂 Love it. You are such an inspiration Blaire!!! Loving all that pop of colors and price points as well. Yay for Amazon Fashion and spring styles!!! Can I say that this is my favorite post ever! I love all the colors!! Definitely thinking about getting the pink Nine West dress. These photos are really very beautiful especially the first set. It is just wowwww….